John Davidson Rockefeller was an American business magnate and is regarded to be the richest man that ever lived. He made his fortune by founding the successful Standard Oil Company. He ran the company for 27 years and by the time he retired he had $2.9 billion as his total fortune. If this amount is adjusted for inflation then the amount is pegged at $370 billion. 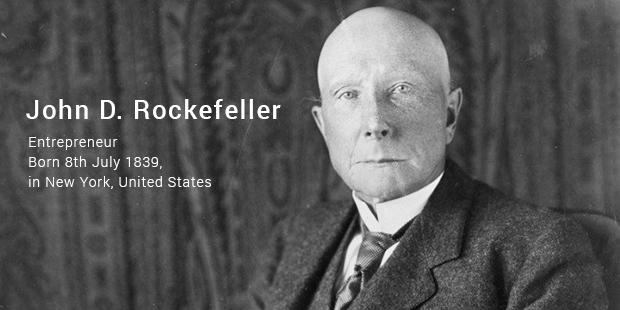 In the year 1902, he was worth $200 million which was about 1% of the whole GDP of the U.S.
John d. Rockefeller was born on July 8, 1839 at Richford, New York. His father was a travelling salesman who did not spend much time at home to look after his six children. Young John was always looking for ways to earn money so that he could help his poor family. He was a very well behaved boy who was serious about studying and helping his family. At a young age itself he learnt to earn money by selling potatoes, candy. He then used to lend this money to his neighbours for a small interest. When his family moved to Cleveland, he attended the Central High School there. After completing his graduation he took a ten- week course in business to get some basic knowledge in order to enter business someday. He was good at Maths and especially accurate in accounting. So he did his first job as an assistant bookkeeper for three months receiving 50 cents per day as salary. He was only 16 years old at that time. Soon he began thinking of setting up his own business. So in 1859, he and his partner raised $4000 in capital for doing a commission business. At first they tried to sell wholesale foodstuffs after which they decided to set up an oil refinery. As there was demand for cheap lighting fuel and everyone was trying to decrease costs, Rockefeller found a way to go ahead. He started off by finding ways to use the by-products of the oil refining process so that he could earn money by selling that as well. The method of using every by-product became useful in decreasing the actual oil prices. Thus his company began to excel at a steady pace. His company became profitable because of the low prices they were offering. He began by buying out companies that were not able to compete and on the verge of shut down. Soon he was able to apply his formula to all the other companies he had bought. Thus now all the companies under him were equally successful. He gave a new name to his company. In June 1870, he named it Standard Oil. Since he was able to control the operations and make each of the companies profitable, he planned on taking over all his competing rivals. One by one his company absorbed 22 out of the 26 competitors in Cleveland. Because of their wholesale production and the bulk shipping they provided, soon they became the numero uno supplier of oil products in America. Now Rockefeller’s vision had given rise to finding of nearly 300 oil based by-products. Due to the aggressive expansion strategy that he used, no competitor could survive against Rockefeller. Soon his competitors either went bankrupt or sold-out to Standard Oil. Before the beginning of the 1880s Rockefeller controlled more than 90% of the oil business in the U.S. He had built one of the biggest monopolies that the world had ever seen. Rockefeller was a man with a vision. He introduced the pipeline system to cut costs of transportation and used innovation to make the industry stronger day by day. Under him Standard Oil had 20,000 domestic wells, 4,000 miles of pipeline and 100,000 employees. He held nearly 25% of the stock in Standard Oil. He was the first billionaire in America. He donated half of his wealth to charitable causes before his death and formed various trusts to distribute the remaining wealth for the development of science, healthcare and education. From lending a few cents to his neighbour, selling potatoes he has taught the world how to do business and supplement economic growth of the country. His has been one of the most successful visionaries the world has ever seen.